Bent Boolean functions play an important role in the design of secure symmetric ciphers, since they achieve the maximum distance from affine functions allowed by Parseval’s relation. Hyper-bent functions, in turn, are those bent functions which additionally reach maximum distance from all bijective monomial functions, and provide further security towards approximation attacks. Being characterized by a stricter definition, hyper-bent functions are rarer than bent functions, and much more difficult to construct. In this paper, we employ several evolutionary algorithms in order to evolve hyper-bent Boolean functions of various sizes. Our results show that hyper-bent functions are extremely difficult to evolve, since we manage to find such functions only for the smallest investigated size. Interestingly, we are able to identify this difficulty as not lying in the evolution of hyper-bent functions itself, but rather in evolving some of their components, i.e. bent functions. 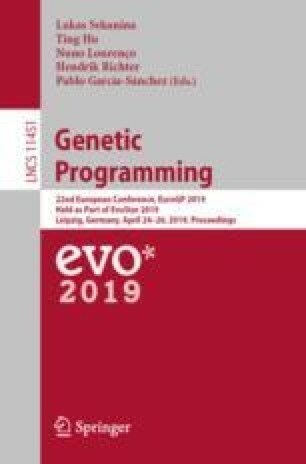 Finally, we present an additional parameter to evaluate the performance of evolutionary algorithms when evolving Boolean functions: the diversity of the obtained solutions. The authors wish to thank the anonymous referees for their useful comments on improving the presentation quality of the paper. This work has been supported in part by Croatian Science Foundation under the project IP-2014-09-4882. In addition, this work was supported in part by the Research Council KU Leuven (C16/15/058) and IOF project EDA-DSE (HB/13/020).